What's New Archive - History Comic Wins Award! 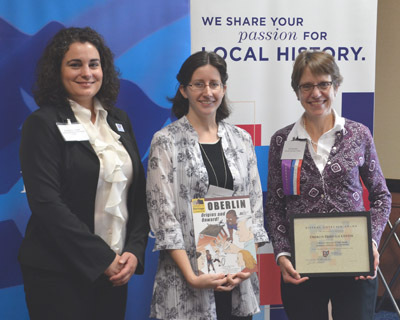 Oberlin: Origins and Onward!, the Oberlin Heritage Center's creative new history comic book, was honored at the annual meeting and conference of the Ohio Local History Alliance (OLHA) on Saturday, October 6, in Worthington, Ohio. The lively and entertaining book, designed to appeal to all ages, received the History Outreach Award in the Media and Publications category. Oberlin Heritage Center Executive Director Pat Murphy and Museum Education and Tour Coordinator Liz Schultz accepted the award on behalf of the organization. This is the fourteenth achievement award that the statewide local history association has bestowed upon the Oberlin Heritage Center in as many years. The comic book provides an informative, broad introduction to Oberlin and its rich and diverse history, from its founding in 1833 right up to the present day. Each page poses and answers a question about Oberlin history and may be used as a stand-alone topic for a classroom or home school discussion or lesson plan. A whimsical bear named "Yeo" (whose name recalls the Oberlin College athletic teams' name, the Yeoman) romps in and out of the 24 action-packed pages of the story. The book was researched and edited by Oberlin Heritage Center project coordinators Murphy, Schultz, and OHC Board member and retired Oberlin third-grade teacher, Gail Wood. Bentley Boyd served as author/illustrator of the book; he is the creator of more than 30 history comic books through his Chester Comix series (www.chestercomix.com). Funding for the project was provided by generous donors to honor the memory of OHC trustee Nicholas Stevenson, a Kendal resident and volunteer for the Grandparent Readers program at Oberlin's Eastwood School. The project includes a provision for distributing a free comic book to each third-grader from Oberlin's Prospect School in their study of community history and their annual visit to the Heritage Center's Little Red Schoolhouse. The history comic book is available for $6.95 per copy ($6.25 for OHC members) at the Oberlin Heritage Center museum store in the Monroe House at 73½ S. Professor Street (behind the Conservatory Kohl Building; park at 20 W. Vine Street). The book can also be purchased online at www.oberlinheritage.org and at Ben Franklin (13 West College Street), Uncommon Objects at the New Union Center for the Arts (39 S. Main Street) or Kendal at Oberlin's Cardinal Shop (600 Kendal Drive). Proceeds support the nonprofit Oberlin Heritage Center's programs and its mission "to preserve and share Oberlin's unique heritage and to make our community a better place to live, learn, work and visit."